Micronit develops and manufactures lab-on-a-chip products for companies, research institutes and universities. 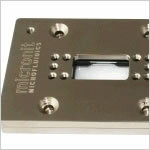 Micronit has extensive experience supplying glass microfluidic devices to life sciences and chemistry. Micronit is an OEM partner, providing a complete lab-on-a-chip solution for analytical instrumentation, but also a research partner, offering research in various application fields.